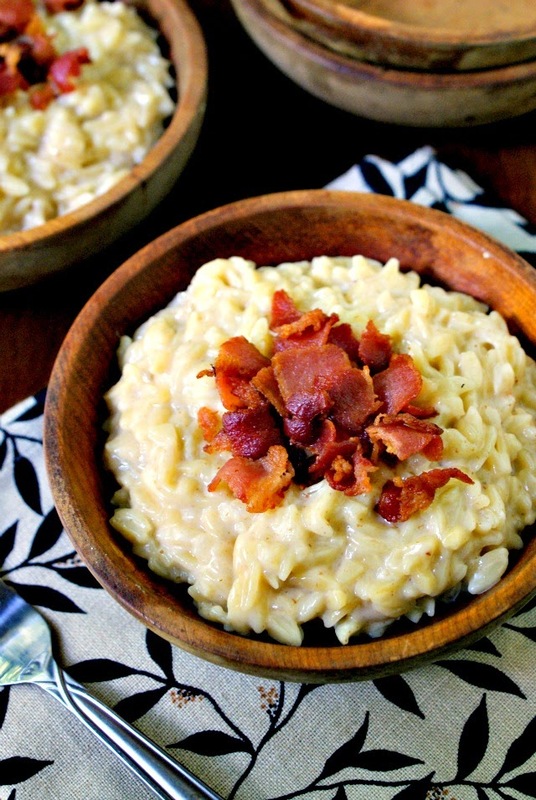 White Cheddar Orzo with Bacon is a rich, cheesy, garlicky pasta side dish with a creamy white cheddar cheese sauce and lots of crispy crumbled bacon. I bought a box of orzo a while back when pasta was on sale buy one, get one free. That's when I usually stock up and I try to mix it up with the variety I buy. My husband is a regular spaghetti kind of guy and the kids like elbow mac. I like it all, so I'm not picky. I saw the orzo and though I could use it to mix things up a bit. Well, that box of orzo sat on the shelf in my kitchen longer than any of the others I bought on that shopping trip. I just couldn't decide how I wanted to dress up the cute little rice-shaped pasta. Then, the 5th Challenge in the Young & Hungry Blogger Challenge was announced. (Read more about the ABC Family Young & Hungry Blogger Challenge here.) It was a "Cheesy Challenge", which I was thrilled about because cheese is totally my thing. I scanned my pantry and fridge and (finally) was inspired to use that orzo! My favorite cheesy meal is my Mom's Mac & Cheese, but I wanted to create an original dish for my submission. I used the same basic components (pasta, white cheddar and milk) and made a pasta side dish that was rich, creamy and absolutely delicious! Using orzo is a great way to mix up the same old boring dinner side dishes and would be great alongside meals like my Oven-Fried Panko Chicken Drumsticks, Grilled Marinated London Broil, or Oven-Baked BBQ Baby Back Ribs. In a large stock pot, boil the orzo according to the package directions. Drain and set aside. In the same pan that you boiled the orzo in, fry the bacon over medium-high heat until browned and crispy. Remove the bacon from the pan and drain off the grease, leaving about 1 tbsp in the bottom of the pot. Add 1 tbsp of butter to the bacon grease and reduce the heat to medium. Add the onions and garlic to the pan and cook for 2 minutes, or until the onions are translucent. Add the flour to the pot and mix with a whisk to remove any lumps. Cook for 1-2 minutes. Slowly add the milk to the pot, whisking constantly. Let simmer for 2-3 minutes, stirring frequently, until thick. Remove the sauce from the heat and mix in the cheddar cheese until completely melted. Add the orzo to the cheese sauce and season with salt and pepper to taste. Top with the crumbled bacon and serve immediately. You can substitute the cheese with another kind, if you like! Yellow cheddar, Parmesan, or Gruyere would be amazing. I am partial to white cheddar, which is what I use in my Momma's Baked Mac & Cheese. It's my favorite cheese! This recipe does not reheat well. The sauce becomes oily and loses it's creaminess after refrigeration. You probably won't have any leftover anyway! 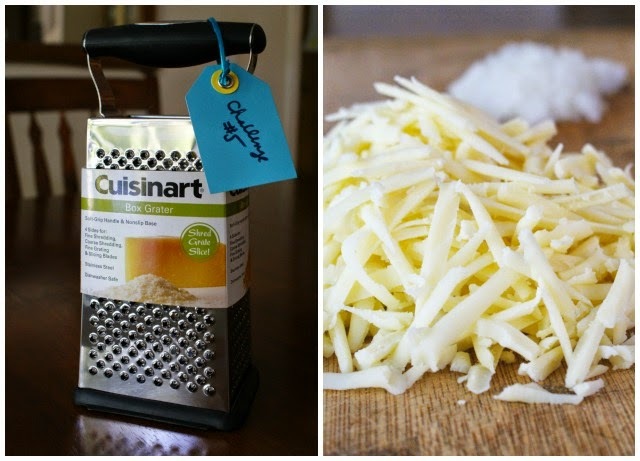 I was provided with a box cheese grater as inspiration for this recipe as a participant in the Young & Hungry Blogger Challenge. As always, all thought and opinions are my own.